The Banner are without some key figures for the Thurles showdown. Conor McGrath and Conor Ryan will miss out for Clare on Saturday. THREE MEMBERS OF the Clare team that lifted the Liam MacCarthy Cup in 2013 will miss next Saturday’s crunch qualifier against Limerick and they will face a battle to be fit if Clare win to progress in the All-Ireland series. Goalkeeper Patrick Kelly, defender Conor Ryan and attacker Conor McGrath all missed last Saturday’s thrashing of Laois. 25 year-old McGrath is battling a hip injury and Clare boss Davy Fitzgerald has indicated that he might not even be ready until an All-Ireland semi-final in August if Clare progress through the back door. McGrath’s latest setback will rule him out for between four and eight weeks, Fitzgerald revealed, while Kelly is looking at a four-week spell on the sidelines. There is some positive news on Ryan, however, who hasn’t featured for Clare since the Allianz League quarter-final victory over Tipperary in early April. Man-of-the-match in the drawn All-Ireland final in 2013, Ryan was diagnosed with a hormonal disorder but is set for some light training as he continues his recovery. “How long it will take him to get back up to full speed, we don’t know,” Fitzgerald admitted. “We have the same injuries as the last day (against Laois) – Pa Kelly, Conor McGrath and Conor Ryan. “Conor McGrath is 4-8 weeks, in that bracket, and would hopefully be back for an All-Ireland quarter-final or semi-final, if we get there. Clare will start as favourites against Limerick to book a spot in the quarter-finals but Fitzgerald is anticipating a desperately tight encounter. It will be a fourth championship clash in six seasons between the counties and Limerick have won two of the last three. The Shannonsiders claimed a qualifier victory in 2012 and also won last year’s Munster quarter-final, although Clare did win the 2013 All-Ireland semi-final. Fitzgerald predicted: “It’s going to be tight and it’s going to be a battle. “There’s going to be nothing in this game. I think we always bring the best out of each other and I’ve a feeling that’s what you’re going to see. 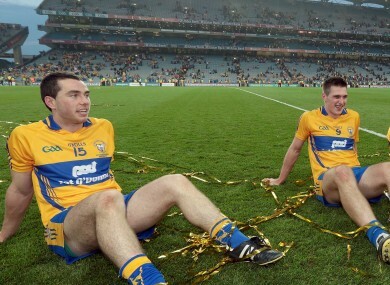 Email “3 players from Clare All-Ireland winning team still out for Saturday's crunch qualifier with Limerick”. Feedback on “3 players from Clare All-Ireland winning team still out for Saturday's crunch qualifier with Limerick”.